To demonstrate, I will use USERS tablespace to Add, Resize, Drop and Rename a data file. First, we can check how many data files are present under USERS tablespace through below command. We can see from above output only a single data file is present under USERS tablespace. The new data file has been added to my USERS tablespace. 1) Take the tablespace offline. 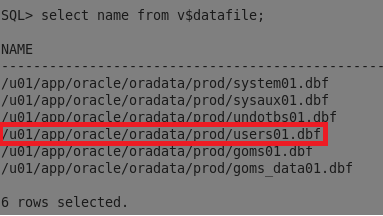 2) From Host need to move the data of a file from a new file which we want to rename. 3) From SQL prompt need to alter the changes. 4) Take the tablespace online.